Most people know that Knightsbridge is one of the most affluent areas of London. It’s famous for being the location of the world renowned department store Harrods as well as the Libyan and Iranian embassies. The architecture is both dramatic and beautiful whether in the new buildings like the One Hyde Park Development or the Victorian mansions. It is also famously next to Hyde Park which hosted the Triathlon events for the summer Olympics, the Taste The Cracklin team have fond memories, having packed their hog roast oven up and took it along to provide gold standard food for the hungry spectators. The Taste the Crackin team in Knightsbridge attend many out door events to bring their own brand of flavoursome, nutritious food to event goers, and once the delicious aromas of roasting pork get caught in the air it doesn’t take long for queues to form by our oven. This time was no exception either. With our excellent warm and herby stuffing and zingy apple sauce all served with the tender, melt in the mouth roast pork we have become famous for. The Hog Roast team were soon far too busy serving hungry spectators to catch a glimpse of the action themselves. After a long day and a herculean effort by our own team of dedicated hog roasters, we packed up ready to prepare for our next function. Taste the Cracklin are just as comfortable catering for large formal functions as they are out in the open cooking for the public. Our formal banquets which include exquisitely dressed tables as well as the wonderful spectacle that is the actual hog roast have met with high acclaim by all those for whom we have provided our unique service. 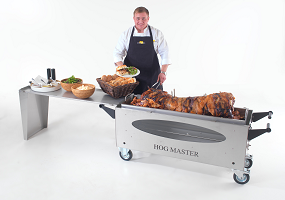 Because we only use special custom designed hog roast ovens which have a special gas powered system, we are able to bring our oven to indoor venues with the assurance that the only smell which will greet you guests will be that of the finest quality meats roasting to perfection. We also provide a range of specialised menus to fit any kind of event from a large formal party to a smaller more informal gathering. And we can tailor our service to compliment your event: if you require waiters, we have a team of serving staff who have been trained to the highest standard to greet your guests and wait on tables professionally and politely. Along with our incredible meats which range from the whole spit roasted pig to whole lambs, rotisserie chickens and even kebabs, we have a variety of fresh salads, starters and canapés to tickle your taste buds. All the items on our menus are made and prepared by the talented Hog Roast chefs on the day to ensure they are served to you fresh and tasty. If you have an upcoming event and want something that will keep your guests talking for weeks afterwards, why not call the Taste the Cracklin Hog Roast team in Knightsbridge and together we will bring you all the pageantry and spectacle that is a traditional hog roast!